Tulip time in Seattle...These tulips were just about ready for full bloom when this shot was taken a week or so ago. It had been raining. Hence, the raindrops. Thanks for stopping by. So pretty and vibrant. The water drops are an added bonus. So pretty - all standing up like soldiers ! Beautiful shot and lovely colour. They look beautiful with the water droplets on their petals. Beautiful - I love the raindrops and bold colour. I like your composition and the pretty colors and droplets. Stunning colour, I got the same ones in my garden ; very strong ! 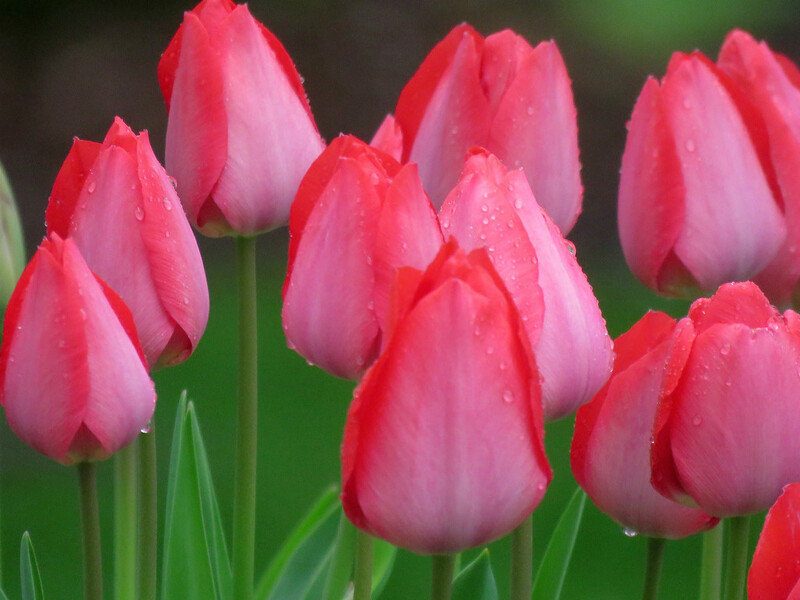 A glorious photo of tulips! Fav! The colors, the raindrops- a fav for me too! Gotta love springtime. Pretty image! Love how you captured this. Just gorgeous!! Fav! Hopefully we will have tulips just like this sometime! Everything is so late around here.